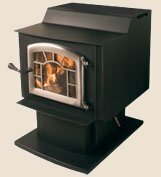 The model Wood Classic sports a "classic" step top design that increases radiant surface and has a double-wall convection chamber to assist in convective heat movement. It takes up to a 20" piece of wood and has up to a 12-hour burn time on a single load of wood. It is capable of heating up to a 2500 sq. ft. home and is manufactured home approved. Optional pedestal with ash pan system or 4 leg styles to choose from.